The ultimate guide to low-budget film production. 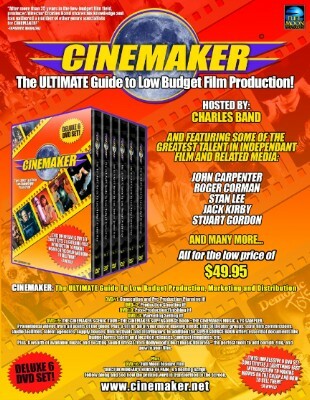 "Cinemaker", the ultimate guide to low-budget production is filled with fun, informative and entertaining secrets of the trade. It's the stuff they never tell you in film school! The Cinemaker kit contains 6 complete DVD programs filled with expert advice and straightforward techniques on how to make a film - on time and within you budget. The A to Z of low-budget movie-making! Disc 1: Conception & Pre-Production - Planning it! Disc 2: Production - Shooting it! Disc 3: Post-Production - Finishing it! Disc 4: Marketing - Selling it! Disc 5: The Cinemaker Supersource. Intriguing promotional videos. Disc 6: Full Moon Feature Film: "Blood Dolls"
and full shooting script. Follow along and see how the printed word is transformed to screen. Also includes lots of extras, such as: "Blood Dolls Videozone" feature, Blooper reel (when things go wrong on the set) and much more. Interviews with Stan Lee and Jack Kirby. Lists of Film & Theater Groups; State Film Commissions; Studio Facilities; Film Festivals and Distributors; Essential Documents: Budget Forms, Talent & Location Releases, Contract Template.